I recently wrote an article on Caroline Lawrence's children's historical detective series The Roman Mysteries, which will be published soon at the online The Journal of Historical Fictions, and Caroline is coming to give a talk at Newman University, where I work, on 20 March 2019. She was kind enough to send me an Advanced Reading Copy of her forthcoming children's book, her first venture fully into the world of science fiction and fantasy (though she's paddled around the edges of SFF before - which is what my article is about!). The Time Travel Diaries tells the story of Alex, a London teenager of Greek descent who travels back in time to Roman London. I've always enjoyed timeslip and time travel stories - as a child, Tom's Midnight Garden was one of my favourite books, and as an adult, I've really been enjoying the Outlander TV series (I haven't read the books yet, but I plan to!). (I also loved reading Time Travelling With a Hamster a couple of years ago, but that was a bit different, as it involved travelling much less far back in time!). One of the biggest benefits of timeslip stories, especially in children's literature, is that it's a lot easier for the author to describe the past clearly when they can use a common frame of reference with the reader. Lawrence uses lots of references to movies and to modern life to explain what's going on to readers as we see everything through pop culture junkie Alex's eyes. It's more than just a few modern references, though. Characters who come from the past don't take note of every aspect of their surroundings every time they walk out of the door any more than we would. In taking us to Roman London with a modern time traveller, Lawrence provides vivid descriptions of the sights and smells of the past world, drawing out all the sorts of things that would seem completely normal to a Roman but completely strange to us. I especially loved her descriptions of the smells of the ancient world, which can be the hardest part to imagine, but is often the most evocative. 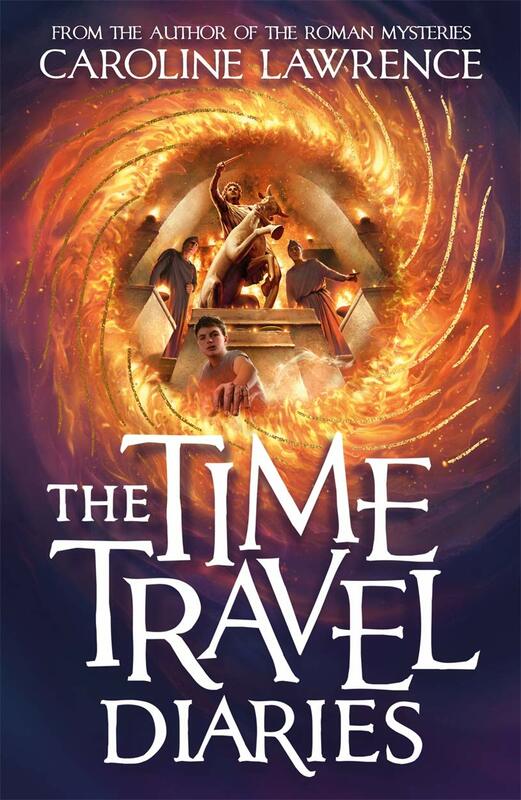 Another of my favourite things in novels is a strong sense of place, and if it includes descriptions of real places, so much the better, so I really enjoyed the use of the London Mithraeum as the location for the time portal in this story. Lawrence's rules for time travel are quite strict (far more so than most timeslip stories) and I appreciated the emphasis on the physical location of Roman London (underneath the modern city). The scenes set there will also hopefully encourage children and their families to visit the site, which is free and very much worth experiencing, as the 'immersive experience' (plunging visitors into darkness and using light and sound to evoke an ancient ceremony) is very effective. Of course, the other advantage to setting anything in a Mithraeum is that we don't know much about the secretive cult of Mithras, which gives authors lots of room to invent detail. The scenes that take place in the Mithraeum are thoroughly researched and follow current thinking about what went on in the cult, but ultimately we don't really know, so stories can take us to places history can't and fill in the gaps however they want to. I won't spoil Lawrence's visualisation of a Mithraic ceremony here, but it fits the known evidence and sounds just about the right level of strange but not too strange to me! (Particularly the symbolic - but not real - actions taken as part of the initiation ceremony). Of course, my absolute favourite thing about Lawrence's strict time travel rules was that she doesn't hold back on the language issue. Alex is chosen to travel back in time to the Roman world because he's been going to Latin club, and he's able to communicate fluently when he gets there because he's fluent in modern Greek (modern Greek is quite closely related to ancient Greek, far more closely than modern English is to Old English). The other time traveller in the story is Romanian and is able to understand a little because modern Romanian is quite close to Latin. The book is full of snippets of Latin dialogue, so it will be a brilliant read for anyone with a little bit of Latin (or who needs to revise Latin for an exam!) - but all the Latin is clearly translated, so it's not a requirement to read the book! I love languages so I really enjoyed that aspect of the story. The three main rules for time travel given to Alex are that he must travel naked, he must not eat anything, and he must interact as little as possible. The naked rule was quite funny and resulted in some amusing scenes as the boys try to find clothing. Interacting as little as possible is a good goal to have but, of course, will always turn out to be impossible or there wouldn't be much of a story! I have to confess I was a bit less keen on the rule about not eating or drinking. 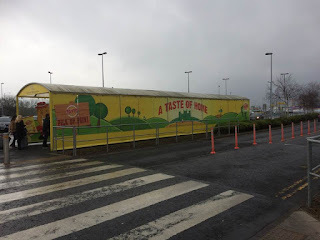 I would have enjoyed descriptions of taste as well as smell (the time travellers can drink, but tend to stick to water), and while I understand that fasting is something practiced all over the world for many reasons, for personal reasons I don't really enjoy reading descriptions of teenagers deliberately avoiding eating food. The novel forms a neat and self-contained story. Only pre-pubescents can time travel according to Lawrence's rules, and the story centres around a girl who died shortly after the events it depicts. This is another link with the real world, as she is based on a real girl whose body was excavated from Roman London, and I love that readers can actually go and see her in reality. It does mean that there isn't anywhere else for the story to go, though! However, nothing is impossible in the world of fiction, whether we join Alex and his friends again, or follow new adolescents back in time (though it's hard to imagine a better qualified pair to time travel to the Roman world than a Greek and a Romanian! An Italian teenager maybe?). 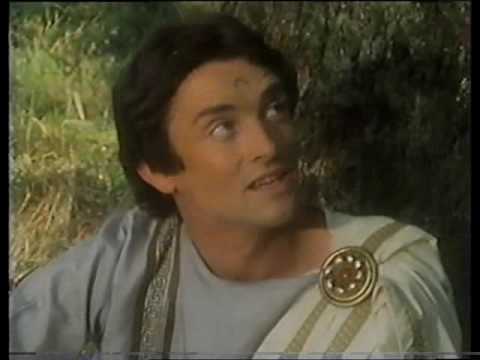 Plus of course, a time machine can go to all sorts of places, and isn't restricted to the Roman world - though since Lawrence is a Classicist I suspect if we see more of Alex or the time machine, we'll return to ancient Rome! I really enjoyed this book, especially the really evocative descriptions of Roman London. I'm good with words but I have terrible trouble visualising things, and Lawrence's descriptions, combined with setting memorable scenes around mud flats and bridges (rather than just stating that they're there) and a clear map really helped me to picture Roman London in a way that I haven't before. It's also nice to be able to visit sites like the Mithraeum or read about the real girl with the ivory knife who inspired the story. I hope the scientists in Lawrence's fictional world find a way for older teens to time travel so that we can go back in time with Alex once again! 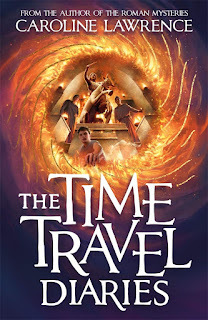 The Time Travel Diaries will be released on 4th April 2019 in the UK. Contains spoilers for Mission: Impossible - Fallout and probably all the previous Mission: Impossible films as well - I don't know, I've only seen Rogue Nation and Fallout! I've been listening to the Empire Podcast's extraordinary 3-part Spoiler Special on Mission: Impossible - Fallout, which features over 5 hours of in-depth interviews with writer and director Christopher McQuarrie on the making of the movie, plus a discussion of the film with Empire magazine's staff. It's a fascinating insight into the movie-making process and a must-listen for anyone with any interest at all in the art and the practicalities of film-making, so (as long as you've seen the film, or don't care about spoilers) I'd highly recommend heading over to listen to it. Part 1 is here. If I ever meet Chris McQuarrie, I'll have to thank him for taking so much time to explain how this process has worked for him and for being so enthusiastic about doing it! During Part 2, Chris Hewitt, Helen O'Hara, Nick de Semlyen and James Dyer talk about the film's early scene set supposedly in Belfast (though, as Hewitt and O'Hara point out, it is clearly not Belfast as there is not a Tayto in sight), in which Tom Cruise's lead character Ethan Hunt is reading Homer's Odyssey. They talk briefly about how the Odyssey links to some of the themes of the film, but point out that the film's plot doesn't really resemble that of the Odyssey in any substantial way. I thought the choice of book was really interesting - and there's a lingering shot of it, so it's clearly meant to mean something - so here's my take on it. - A difficult journey, specifically by sea. - Numerous adventures. However, please note that this bit occupies only three 'Books' (i.e. chapters) of a 24-Book poem, and there's a good chance Odysseus is making it all up to impress King Alcinous and his pretty daughter Nausicaa anyway. - The homecomings of veterans returning from a long war (not limited to Odysseus himself). - Marriage and the joy of coming home to a faithful wife (as opposed to an unfaithful wife whose lover murders you, like Agamemnon). - Kingship and the importance of not letting the plebs take over your kingdom while you've been away for 20 years fighting someone else's war and then shagging a sea goddess. This part tends to get brushed aside by modern versions! Safe to say, it's probably 'long and difficult journey' and 'homecoming of veterans' that McQuarrie and the film-makers are going for here! As Team Empire point out, the plot of Fallout ends up going in rather the opposite direction to the Odyssey. Ethan is reunited with his wife, but she has left him and married someone else, and the film clearly implies that this is a good thing, that she is happy, and that Ethan should (as he has done) let her go. So why the Odyssey flag at the beginning of the film, if this Penelope has gone off and married one of the suitors? I'd suggest that the Odyssey reference is implying the search for a home, including a partner of the desired gender (in this case a woman). OK, Ethan's Penelope has left, but there is another woman with him at the end of the film. Indeed, the reminder at the beginning of the film of Odysseus' desire to return to his wife plays into the scene near the end when Ilsa sees Ethan talking to Julia. She is concerned that, like Odysseus, Ethan will want to return to his lost love - but unlike Odysseus, Ethan is able to move on. Both Rogue Nation and Fallout play with the idea that Ethan could, if he chose to, retire from his lifestyle full of dangerous adventures and create a more stable home with Ilsa, who is a veteran just like him, who shares his experiences and understands them in a way Julia never could, but who doesn't actually want to live that way. 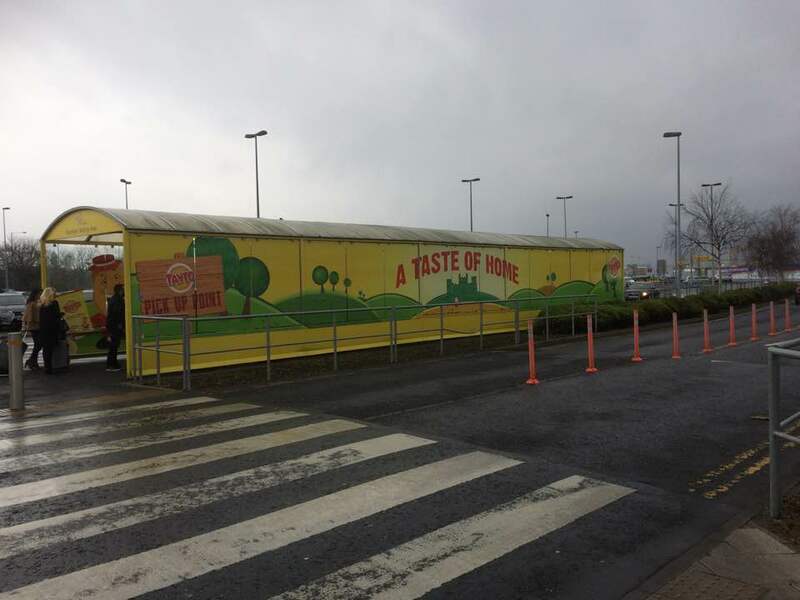 There is just a hint of a suggestion that perhaps, eventually, Ethan could finally come 'home', in the sense that he could create a home, instead of sleeping alone in a dark room with a sad lack of cheese and onion Taytos (the best flavour). There is another inversion of the plot of the Odyssey in this film as well. Odysseus famously manages to lose his entire crew over the course of his voyage, largely due to their own stupidity and inability to follow simple instructions. 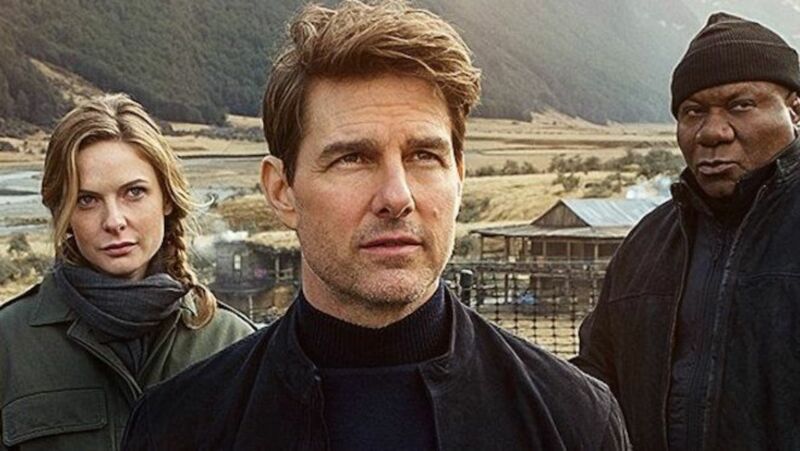 Ethan Hunt, on the other hand, is motivated throughout the film by his desire not to lose any of his crew, and is criticised for caring too much about their lives instead of his mission. In this way, his reading of the Odyssey at the beginning of the film acts as a warning, and a reminder of how important it is to him to avoid Odysseus' fate in that respect. Both inversions are reminders of what could have been - a happy ending denied (possibly prompting him to look for a new one), and a tragedy avoided. Having covered Marcus Aquila's arrival in Britain in the first episode, it is this second episode that really sets up the characters we'll be following through the rest of the story as our hero meets and buys a British slave called Esca. Both the book and the TV series cover Marcus' relationship with another Briton, before Esca, in detail. He first meets and befriends Caradoc, and goes hunting with him. 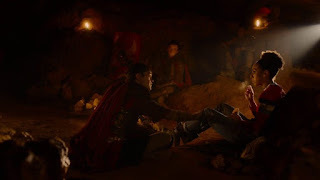 However, Caradoc conspires with other British to attack the fort and the ensuing battle, in which Caradoc is killed, is when Marcus received his career-ending injury. The film touched on this, but the television series is able to devote the whole of the first half-hour episode to it, making it a separate point in itself. When Marcus meets Esca, therefore, he has much more reason to be wary of making friends with any Briton, and to worry about how their loyalty to other Britons may conflict with friendship with him. The series also drives the point home with flashbacks of Caradoc, just to make sure no one has missed the point, so there is much more tension between Marcus and Esca on both sides here. Esca has a Northern English regional accent. The lack of RP, in the 1970s, presents him as lower class (at that time, newsreaders and other television personalities all used RP). His geographical origins are, of course, important to the story. 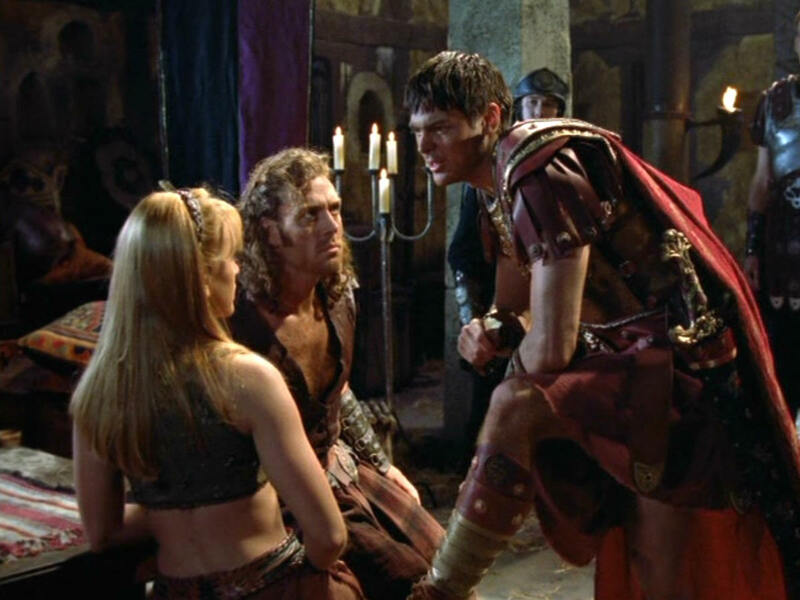 The series also includes Marcus' love interest, who was left out of the film to focus on the relationship between Marcus and Esca. Unsurprisingly, she looks a lot older than 13, as she is in the book! That would be creepy. 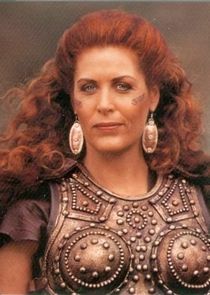 Camilla/Cottia is from the Iceni tribe and has reddish hair, because heaven forbid we should get through a story set in Roman Britain without a reference to Boudicca! Unlike the other British characters, Cottia has an RP accent though, presumably to emphasise the Roman upbringing she is getting from her Roman aunt and uncle. We get to see some gladiatorial combat in this episode, and the set for the small provincial amphitheatre is fairly impressive. All of our heroes, while not necessarily against blood sport in humans, are against animal cruelty, as modern literary Romans nearly always are. Audiences can accept that these people of a different time are okay with humans fighting and killing each other, but not that they are okay with animal cruelty. This is why the dog never dies in action movies. This is where we meet Esca and in another unsurprising move, he's fighting a retiarius. 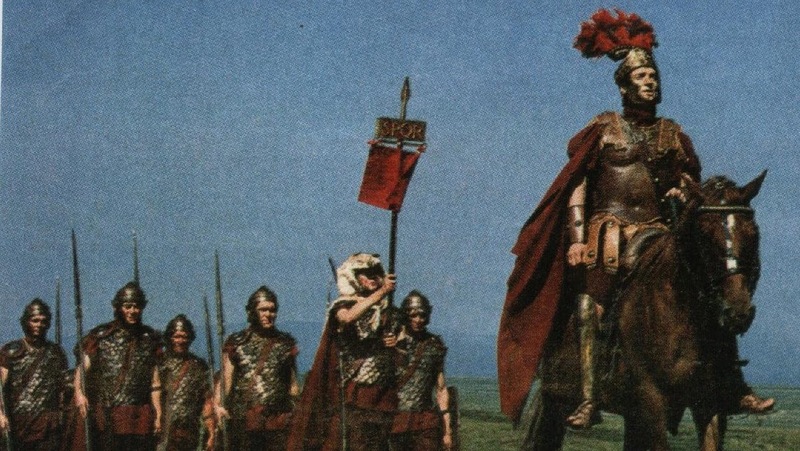 There's something about the retiarius (the fighter who uses a net and trident) that really appeals to film-makers, presumably because it looks so different to more familiar forms of single combat from other eras, like sword fighting. 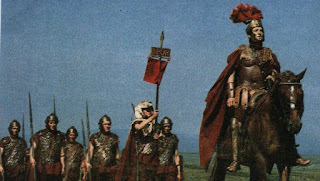 A retiarius is clearly, absolutley Roman. I really like the way the Roman and Esca the Briton take completely different fighting stances here, not just due to their different weapons, but as a visual reminder that they have been raised in completely different ways, with completely different fighting styles. The series continues to make good use of its budget in several ways. I'm impressed with the full on pool in the bathhouse (with everyone wearing shorts because child audience!). The apparently mechanical wolf in one scene is a bit distracting though. I've been sitting on this book for two years and finally managed to read it! It's been a busy couple of years. I'm very glad I did though - as ever with Caroline Lawrence's books, I thoroughly enjoyed this. After taking months and months to read a very long non-fiction book about America and American history (In America: Travels with John Steinbeck by Geert Mak, which I thoroughly recommend, but it took me a while to get through it) I devoured this one in a few nights. I was so pleased to finally sit down and spend time with these characters again. My heart will always belong to Flavia and Nubia, but Juba, Ursula, Fronto and Bouda are equally engaging and likeable characters with fascinating stories to tell. 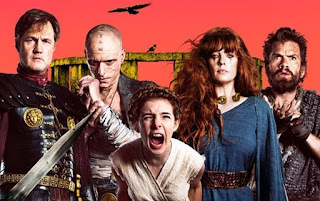 As a British person living in England, the special joy of this series lies in the setting in Roman Britain, and in recognising familiar places. I love the Roman Baths at Bath, so the visit to Aquae Sulis was great fun. I've still never been to Caerleon, so this was another reminder that I really need to get there! I also really enjoyed the descriptions of British Iron Age village life (which made a refreshing change from Roman, though I sympathise with Fronto feeling more at home in Roman buildings!). The story is framed by the Celtic festivals of Samhain and Beltane, and features two very different giant Wicker Men. These are best known from the film(s) but, as the book tells us, they are described by Caesar and Strabo, and I've been teaching these texts (looking at them together together with the evidence of human sacrifice from bog bodies) for years so I got a kick out of that. 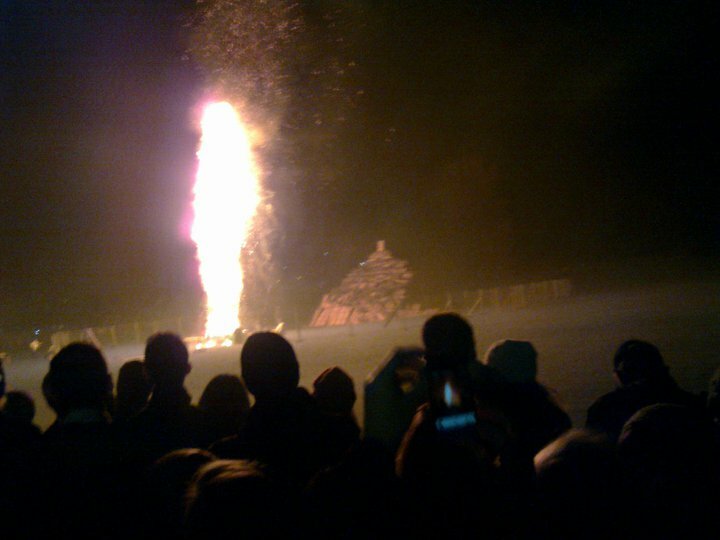 You can still see a sort of survival of this custom in some Guy Fawkes celebrations - I went to Bonfire Night in Oxford in 2010 and the 'guy' - usually a human-size figure in early modern dress sitting on the bonfire - had been replaced with a giant wicker man which was set alight. but this is the giant corn dolly/Wicker Man on fire! On the Classical side, one particularly effective scene has the two young girls, Ursula and Bouda, kidnapped while they are out picking flowers and making garlands in a spring meadow. This clearly followed ancient descriptions of the abduction of Persephone and was all the creepier and more effective for it. Thankfully, the girls' abductors had a different aim in mind than Hades did. The first book in this series, although it followed all three Roman children's perspectives, focused primarily on Juba, and this second highlights Fronto. His story, in which he joins the army, reminded me a little of Rosemary Sutcliff's classic The Eagle of the Ninth, and brought with it another fascinating change of scenery. 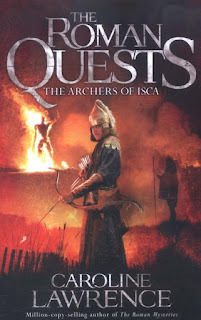 Presumably the third and fourth books will highlight Ursula and Bouda - I'm especially looking forward to the Bouda volume, as she is still a bit of a mystery here!